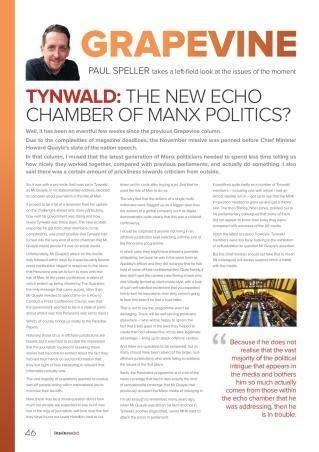 In his latest Grapevine column for Business365, Paul Speller asks whether Tynwald has become the latest echo chamber. Paul says it is time to end the self-congratulation that has started to pervade and warns that the public want more from their politicians. You can read the December edition of Business365 here. Gallery | This entry was posted in News and tagged Business365, Grapevine, Isle of Man, Paul Speller, Tynwald. Bookmark the permalink. 4 Responses to Is Tynwald an echo chamber?